Welcome to the Week 15 Wide Receiver Rankings! This is going to be an interesting weekend for fantasy footballers. The stakes are huge but the offense is drying up a bit. I had trouble liking most of what I was forced to list as WR3 options this week. They just aren’t that much stronger than the WR4s or even the WR5s for that matter. Teams are spreading the football around these days, so while there’s plenty of offense out there, it’s not as easy as it once was to isolate high percentages of it. Measuring matchups and actual opportunity within offenses is becoming more and more crucial. That’s what I’ll be endeavoring to do over the next day or so before I update all of the rankings. This week’s update will come before the start of Saturday’s games. The main Sunday slate is a bit of a _____ this week. Two of the best games are off the slate. I think a lot of folks will be heavily invested in the Steelers/Patriots game, and I may be one of them. It’s ugly out there. I’m already thinking about a RB-heavy approach where I target the most floor I can find at receiver. Michael Thomas, Tyler Boyd and Corey Davis all have my attention at this point. This week’s DFS pod COULD be pushed to Sunday morning depending on how fast I can get the rankings update into good shape. The Saturday games create a bit of a time crunch. I’ll be back later today with the running back and tight ends. 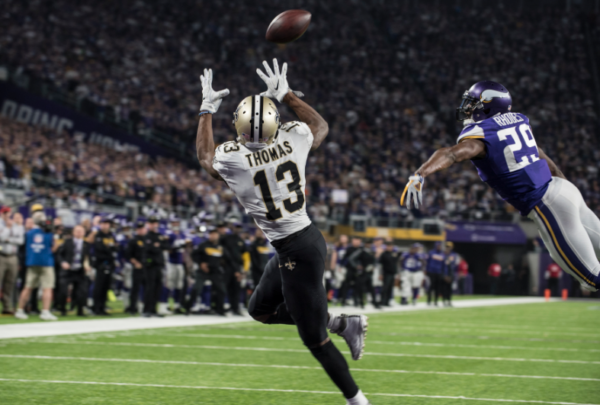 1 Michael Thomas NO 8.600 NO@CAR 12/17/2018 08:15PM ET Good matchup no matter how they choose to defend him. 2 DeAndre Hopkins HOU 8.200 HOU@NYJ 12/15/2018 04:30PM ET The Jets don’t have anybody to cover him. He’s a safe play. 3 Antonio Brown PIT 8.500 NE@PIT 12/16/2018 04:25PM ET Tough matchup with Stephon Gilmore but he may see some one-on-one looks if they opt to double team JuJu. Still plenty of upside with AB this week. 4 Davante Adams GB 7.900 GB@CHI 12/16/2018 01:00PM ET Should be the primary weapon as always. 5 JuJu Smith-Schuster PIT 8.000 NE@PIT 12/16/2018 04:25PM ET Expect plenty of fireworks this weekend in Pittsburgh and Juju will get in on it. 6 Julio Jones ATL 8.400 ARI@ATL 12/16/2018 01:00PM ET No practice but they say he’ll be ready. Tough matchup with Peterson but he’s Julio. He’s a WR1 unless it’s a serious injury and it’s not. 7 Adam Thielen MIN 8.600 MIA@MIN 12/16/2018 01:00PM ET They have nobody to defend him. 8 Brandin Cooks LAR 7.300 PHI@LAR 12/16/2018 08:20PM ET Great matchup, but he’ll need to get his early because the Eagles are a potential road apple. I do not expect that 2017 from Nick Foles. 9 Robert Woods LAR 7.400 PHI@LAR 12/16/2018 08:20PM ET Should do very well but they may not throw much in teh second half. 10 Stefon Diggs MIN 7.600 MIA@MIN 12/16/2018 01:00PM ET He should be healthier this week and that’s big. 11 Mike Evans TB 6.700 TB@BAL 12/16/2018 01:00PM ET Tough matchup. One of the toughest. 12 Julian Edelman NE 7.200 NE@PIT 12/16/2018 04:25PM ET Like this matchup for him. 13 Amari Cooper DAL 7.500 DAL@IND 12/16/2018 01:00PM ET He’s rolling, but this is a tougher matchup than what he’s seen recently. 14 T.Y. Hilton IND 6.800 DAL@IND 12/16/2018 01:00PM ET Has an ankle issue this week. No practice, so he’ll be addressed when I do the update. He’s a great option if he’s on the field. ***UPDATE*** No practice for Hilton this week so there’s obvious concern here. The Colts play at 1pm, so you will have options. Stay on top of this. It sounds like he’s got maybe a 1 in 3 shot at being deactivated. 15 Tyler Boyd CIN 5.700 OAK@CIN 12/16/2018 01:00PM ET Like Boyd here. Oakland will have trouble with him and they don’t pressure the QB. Boyd gets a bump in full PPR. 16 Jarvis Landry CLE 6.500 CLE@DEN 12/15/2018 08:20PM ET No Chris Harris in the slot so Landry’s in good shape. 17 Corey Davis TEN 5.600 TEN@NYG 12/16/2018 01:00PM ET I like this matchup for him. 18 Josh Gordon NE 6.400 NE@PIT 12/16/2018 04:25PM ET He’ll see a fair amount of Joe Haden. 19 Tyler Lockett SEA 6.200 SEA@SF 12/16/2018 04:05PM ET Better matchup than last week but not a great matchup. 20 D.J. Moore CAR 5.800 NO@CAR 12/17/2018 08:15PM ET Tough matchup but they need to be aggressive in a must-win situation. 21 Larry Fitzgerald ARI 4.700 ARI@ATL 12/16/2018 01:00PM ET He’s going to see the ball. Count on it. 22 Kenny Golladay DET 5.400 DET@BUF 12/16/2018 01:00PM ET Has a sturdy target floor on this barren godforsaken roster, but defenses know who to lean on so he’s been less than efficient. 23 Curtis Samuel CAR 4.300 NO@CAR 12/17/2018 08:15PM ET He should see their weaker corners for the most part, and they finally seem intent on using him. 24 Sterling Shepard NYG 4.400 TEN@NYG 12/16/2018 01:00PM ET If OBJ sits, then he gets a solid bump. ***UPDATE*** OBJ is out. 25 Calvin Ridley ATL 5.000 ARI@ATL 12/16/2018 01:00PM ET He’ll avoid Patrick Peterson most fo the day so the ball should find him. 26 Allen Robinson II CHI 5.500 GB@CHI 12/16/2018 01:00PM ET Tough matchup but he’s practicing so he’ll play. 27 Alshon Jeffery PHI 5.600 PHI@LAR 12/16/2018 08:20PM ET Foles at QB and Aqib Talib is healthy for the Rams. Not great. 28 Doug Baldwin SEA 5.300 SEA@SF 12/16/2018 04:05PM ET He’s a good play IF he gets in some practice (hip), but this injury is serious enough where he’s already missed a game. You need to have a plan B here. I’ll update Baldwin on Saturday. ***UPDATE*** He’s a decent WR3 play and seems likely to play after getting in two limited sessions. 29 Dante Pettis SF 4.400 SEA@SF 12/16/2018 04:05PM ET Tough matchup here, but he’s looked very good and the playing time should continue with Pierre Garcon IR. ***UPDATE*** Pettis sis listed as questionable with a sore foot. It sounds minor but any mid-week injury is worth tracking. Make sure he’s a go before locking him in. He’s a late start so make sure you have a plan B or just use a player going early if things are still in doubt. 30 Dede Westbrook JAX 4.500 WAS@JAX 12/16/2018 01:00PM ET Has the best matchup of the Jags receivers and has teh best rapport with Cody Kessler. 31 DaeSean Hamilton DEN 3.900 CLE@DEN 12/15/2018 08:20PM ET He should be their most targeted player and with Denzel Ward out, the coverage has loosened up a bit. It’s a shame Hamilton is off the main slate. I like him a lot here. 32 Robby Anderson NYJ 3.900 HOU@NYJ 12/15/2018 04:30PM ET He’s the only healthy weapon the Jets have this week. Enunwa is out. Expect Darnold to go after Robby early and often. He’s a volatile option but he also has big game potential. 33 Chris Godwin TB 4.900 TB@BAL 12/16/2018 01:00PM ET Last week was brutal and this is a tough matchup, but the Bucs will throw it and D-Jax is probably out again. 34 Kenny Stills MIA 4.300 MIA@MIN 12/16/2018 01:00PM ET Tough matchup but he should get enough snaps away from Xavier Rhodes to be a viable WR3 option. 35 Josh Reynolds LAR 4.700 PHI@LAR 12/16/2018 08:20PM ET Great matchup but it could be a blowout with Wentz now hurt. 36 Adam Humphries TB 5.100 TB@BAL 12/16/2018 01:00PM ET He’s a decent floor play but he has a lower ceiling in this tough matchup. Still, no D-Jax locks in targets for Humphries, Evans and Godwin. 39 Courtland Sutton DEN 4.500 CLE@DEN 12/15/2018 08:20PM ET Good matchup and he’s no longer (thigh) on the injury report. 40 Mohamed Sanu ATL 4.600 ARI@ATL 12/16/2018 01:00PM ET Good spot to flex him, but always a little risky. 42 John Brown BAL 4.400 TB@BAL 12/16/2018 01:00PM ET Good matchup but he has an erratic quarterback. 65 Kendrick Bourne SF 3.500 SEA@SF 12/16/2018 04:05PM ET He’s playable if both Pettis and Goodwin sit. Heck, he’s a decent deep flex if either one of them sit. Garcon is already out. 66 Josh Doctson WAS 4.100 WAS@JAX 12/16/2018 01:00PM ET In concussion protocol. Questionable for Week 15. ***UPDATE*** Still questionable. 72 Marquise Goodwin SF 4.500 SEA@SF 12/16/2018 04:05PM ET Questionable with a calf injury. 82 Ryan Switzer PIT 3.400 NE@PIT 12/16/2018 04:25PM ET Questionable with an ankle injury. 114 Keenan Allen LAC 7.800 LAC@KC 12/13/2018 08:20PM ET (ALREADY PLAYED) Great spot for him tonight. Could see 15 targets. Lock him in all seasonal lineups and give him strong consideration for Thu-Mon contests on DraftKings. 115 Tyreek Hill KC 8.300 LAC@KC 12/13/2018 08:20PM ET (ALREADY PLAYED) He’s playing at less than 100 percent. 116 Mike Williams LAC 4.100 LAC@KC 12/13/2018 08:20PM ET (ALREADY PLAYED) Similar to Tyrell in terms of being able to go off at a moment’s notice and has been more active of late. The matchup is a good one. 117 Chris Conley KC 4.000 LAC@KC 12/13/2018 08:20PM ET (ALREADY PLAYED) Should see some action this week. A viable flex option. 118 Tyrell Williams LAC 4.300 LAC@KC 12/13/2018 08:20PM ET (ALREADY PLAYED) Always a threat to make the big plays and this defense will certainly give them up at times. Still, he’s been quiet lately so tough to depend on anything. 119 Travis Benjamin LAC 3.200 LAC@KC 12/13/2018 08:20PM ET (ALREADY PLAYED) He’s playing more and making as much of an impact as the two Williams guys over the last three games. 120 Demarcus Robinson KC 3.700 LAC@KC 12/13/2018 08:20PM ET (ALREADY PLAYED) A deep flex with big play potential. 121 Kelvin Benjamin KC 3.400 LAC@KC 12/13/2018 08:20PM ET (ALREADY PLAYED) No, no no no.